Oct. 11, 2013 6:00 p.m.
Corrine Fraser Along with Her Multi Media Picture of the Sad Little Girl"
Alberta held its annual Culture Days this past September 27-29th weekend. All across Alberta there were various activities happening all in the name of culture building. 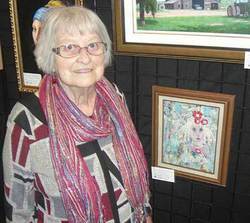 Nicely tucked into this weekend’s theme was the Wetaskiwin Art Clubs annual Art Show, held at the Allied Art and Craft Centre. Wetaskiwin Art Club President Judy Dancey and Allied Art and Craft Centre President Terry Demoline worked together to make this festival happen. Previous years saw the Wetaskiwin Art Club hold their show at the Heritage Museum. The change of venue worked out well for this year’s edition. On Saturday or Sunday you could have walked into the Art and Craft Centre for a multimedia experience of art and culture. The art work was exceptional with a number of artists displaying their wares. Paintings, pottery, jewelry, bronze sculpting, Native dancing, there was something for everybody. If you wanted to be an art critic for a day you could have tried your luck at picking the “viewer’s choice” for the best painting. If you were lucky you might match the judge’s choice and take home a free painting of your own. Raffles tickets along with a silent auction and face painting were available for whomever. If you needed a snack there were edibles provided free of charge as you perused through. Artist Margot Soltice along with a collection of her seed mandalas was set up at a table as she tried to raise awareness for Permaculture and sustainable living. Margot’s Mandalas were made of seeds, berries, and grass, and looked like mini wreaths. A mandala is a circular figure that in some societies represents the universe. She wanted to “illustrate the impermanence of life” with her art. Permaculture promotes using nature in an everlasting responsible way. Painter Corrine Fraser started painting “when I retired” and had some of her paintings on display. Corrine used to “make teddy bears out of recycled clothes and one day asked my sister to help me. My sister said I will help you if you take a water color painting course with me”. Since that day Corrine has developed a passion for painting. Her sister according to Corrine jokingly “did not continue on with her painting foray, and I am not making teddy bears anymore”. Bronze sculptor Zazo had some native and western busts on display. Zazo is highly regarded in his field of art and has done some high profile bronze art. The Strathcona Firefighters Memorial Monument is his work, as is the statue of Italian entrepreneur/humanitarian Frank Spinelli that sits at a picnic table year round overseeing the park and the Italian Centre Store in downtown Edmonton. Four year old award winning Native dancer Emma Small Boy Zorthian stole the show for a while on Sunday afternoon with her jingle dance. Little Emma has been dancing all her life. Mom Terri and Dad Jason were there to support her and are heavily involved in promoting dance themselves. Jason is also an award winning dancer and on this day pounded the “championship drum” and chanted as daughter danced. Their two 11 and 12 year old sons were also penciled in to appear but couldn’t make it. Mom Terri “hopes the dancing helps build a stronger culture and better community”. Emma’s jingle outfit called a medicine dress represents the wife of a hunter. The dance and the outfit symbolize positivity and healing. In between Emma’s dances Dad Jason spoke to the crown about the meaning and spiritual power of the dances, and did a very good job at it. Wetaskiwin Art Club President Judy Dancey has been involved since 1995 and says “there are still some original members’. The club was formed in the 70s and “gives local artists an opportunity to meet each other and explore different ways of expanding their knowledge and love of art”. The art club has a display at Wetaskiwin Mall during Farmer’s Market on Wednesdays from 10-2pm. Allied Art and Craft Centre President Terry Demoline says “our mandate is our courses, and they offer a wide variety. Anything from drawing lessons, soapstone carving, kid’s pottery, mixed media art, stained glass, painting, henna etc. Both Terry and Judy encourage “anybody and any level of artist to become part of the group”. It was a nice intimate show and good day. Now for some much needed drawing lessons.